My daughter has not started school yet but it is always a challenge for me to look for ways on how I can teach her while at home. A child learn the basics at home. Actually I have started finding "creative ways" in order for me to teach writing, reading, counting and enhance her art skills thru play. 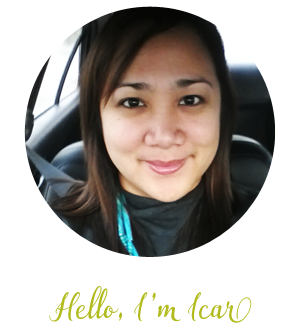 While she is still young to go to school, there are Bay Area Summer Camps that she and other kids can go to that promotes fun while learning. 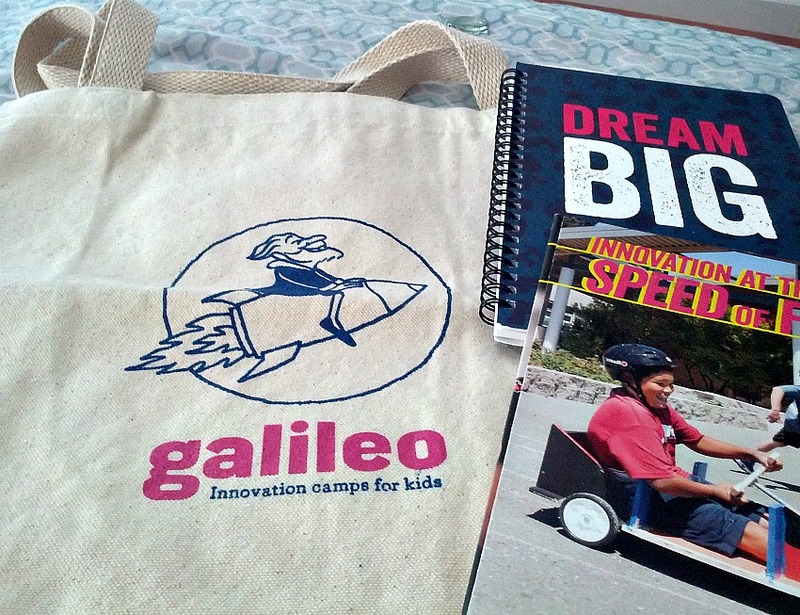 Galileo Camps curriculum team spends thousands of hours developing creatively fertile themes, activities and majors. 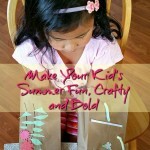 Imagine a summer camp your kids love. Where they find themselves engrossed in art projects, science challenges and outdoor activities that make them laugh, think and express themselves with complete freedom. 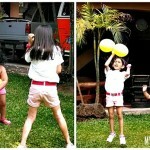 That’s the kind of camp Galileo is. But under the surface, there’s something deeper going on. The result is a summer camp experience kids love, that has a deep and lasting impact they—and you—will begin to appreciate more and more as they develop. Inspired by expert instructors – many of them professionals in their fields – campers realize their personal vision. Each week is an opportunity to try something new, or go deeper in a major they already love. Galileo Camps sent some materials to make illuminated cards. 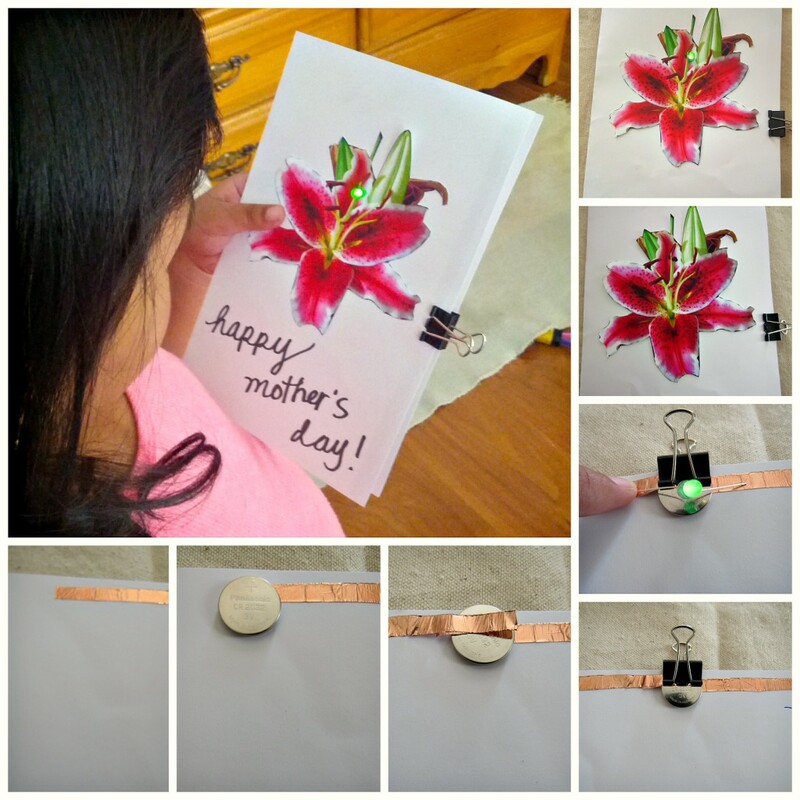 Since Mother's Day is coming up, my daughter and I decided to make a Mother's Day card. 1. Fold one piece of cardstock in half. 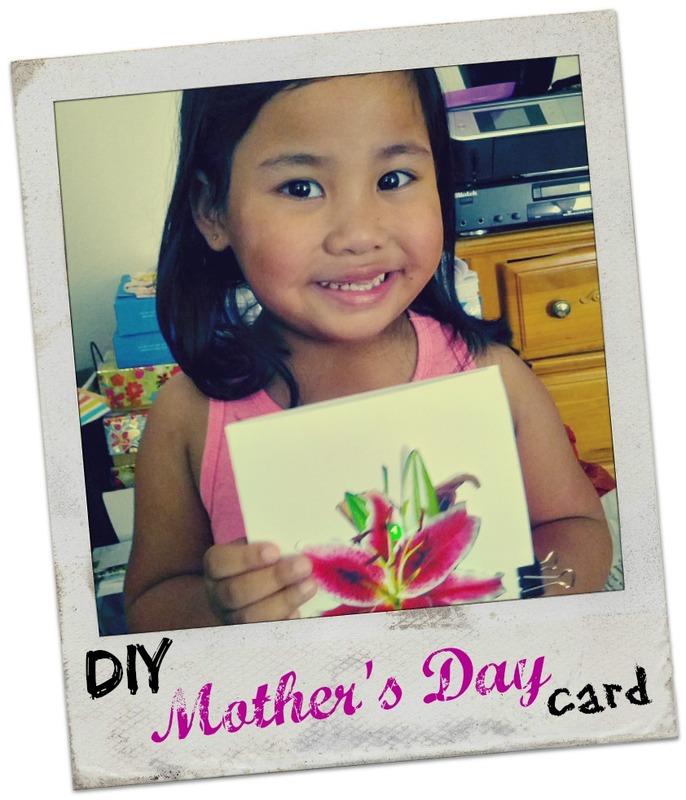 Use markers or colored pencils to design a greeting card which can have a special light-up feature in mind. Since I am not so good in drawing, I just decided to print a stargazer photo and cut it as the design of the card. 2. Measure a piece of copper tape halfway along the edge, cut it, peel off the backing, and stick it down. 3. Place the battery negative side down so that the negative side is touching the copper tape (you can draw a ( – ) sign as a reminder that this is the negative plate). 4. Next, measure another piece of copper tape that overlaps the first piece by at least an inch. Just likethe first piece peel the backing off the copper tape and stick it down, stopping short of the battery. 5. Fold the edge of the tape over. The tape should still touch the battery when folded over. To make this a positive plate, it needs to touch the top of the battery, and only the topside of the tape is conductive. ( you can draw a ( + ) sign next to this piece of tape to remind you this is the positive plate. 6. 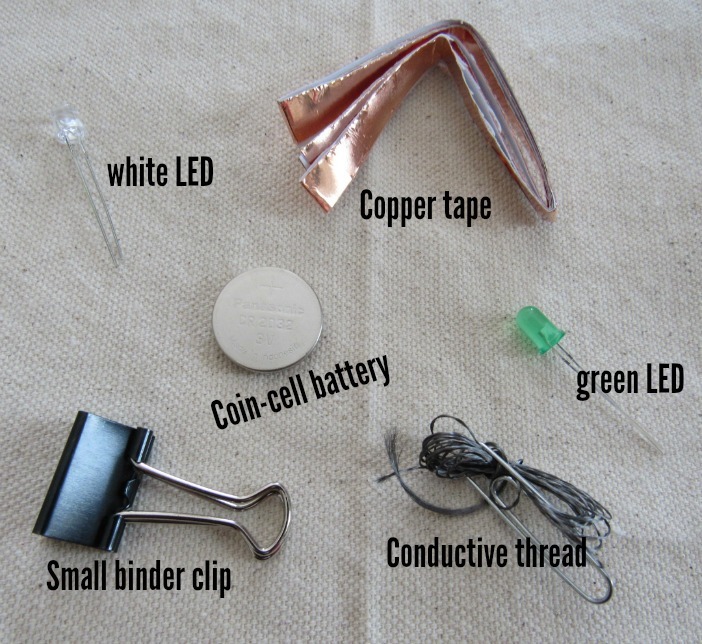 Use a small binder clip to keep the battery sandwiched between the two pieces of copper tape. 7. Test out your plate by taking an LED, spreading the leads out a bit, and touching each lead to the correct plate. It should light up, just as if it were connected directly to the battery. 8. Punch a small hole where you want an LED. The hole should go through the front of the card but not the back. Choose an LED, insert it into the hole, open the card, and spread the leads out to hold the LED in place. 9. Measure out two pieces of conductive thread, long enough to reach the battery plates from the LED leads. Use scotch tape to tape a thread to each lead. 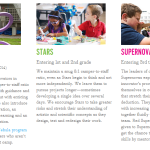 Galileo Camps, encourages kids to brainstorm and think like innovators through a variety of hands-on projects and activities. With weekly imagination-sparking themes and in-depth majors like Digital Photography, Fashion Design, Inventors Workshop, Go Kart Builders, Video Game Design, 3D Modeling and Printing, and Chefology just to name a few. SAVE $50 when you sign up for Camp Galileo or Galileo Summer Quest at one of our Los Angeles locations. Enter promotional code 2015GALILEOCAMPSLA. 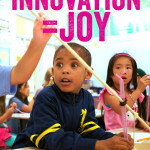 SAVE $30 when you sign up for Camp Galileo, Galileo Summer Quest or Summer Camps @ The Tech. Enter promotional code 2015GALILEOCAMPSF. Limited to one use per family. Not valid in combination with additional offers or for previous purchases. Offer valid through 5/31.